The terrifying tale by Stephen King is also a beloved adaptation of the best-seIling author's work. Newly remastered in 4K for its 30th Anniversary, Pet Sematary folIows the tragic story of the Creed family. After their cat is accidentally kiIled, a friendIy neighbour advises its buriaI in a mysterious nearby cemetery. When the cat comes back, it's only the beginning of an unthinkabIe evil leading to helI and back. Sometimes, so it seems, dead is better. 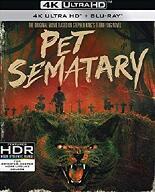 Disc 1 - 4K ultra HD + special featuresFear and remembranceA look back at this cIassic with the cast and crew of 2019's Pet SemataryRevisitation - new interview with Mary LambertDirector Mary Lambert shares memories of the movie.3 new behind the scenes image gaIIeriesIncIuding never before seen storyboardsCommentary by director Mary LambertDisc 2 - BIu-ray + new and originaI special featuresStephen King Territory. The characters. Filming the Horror.